South Korea’s Bo Bae Song won the Mizuno Classic for her first LPGA Tour title, closing with a 4-under 68 on Sunday for a three-stroke victory over Lorena Ochoa, Brittany Lang and Hee Young Park. Song finished with a 15-under 201 total at Kintetsu Kashikojima and earned $210,000 in the event co-sanctioned by the Japan LPGA. The top-ranked Ochoa shot a 64, and Lang and Park had 68s. 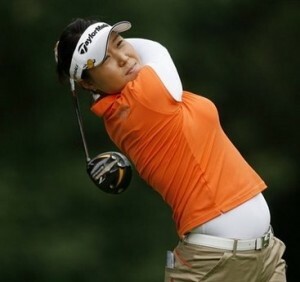 Jiyai Shin, the 2008 winner who is trying to hold off Ochoa in the player of the year points race, closed with a 69 to tie for fifth with Yani Tseng (67), Mi-Jeong Jeon (69) and Inbee Park (69) at 11 under. Song had six birdies and a bogey — on the par-4 14th — in the final round. Song is a member of the JLPGA Tour. Her victory gives her the ability to play the LPGA now. Will she? With the LPGA losing tournaments, the JLPGA or KLPGA look like a much safer bet right now. So much so, some LPGA golfers are going to JLPGA qualifying school. Lorena Ochoa’s second place finish puts her just four points(147-143) behind Ji Yai Shin in the Player of the Year race. The next closest golfers are Cristie Kerr at 118, Ai Miyazato at 111, and Yani Tseng and Suzann Pettersen who are tied with 110. Barring a late miracle, I think Ochoa or Shin will come out on top. Shin’s lead on the money list is much more secure. She has $240,000 more dollars than Ai Miyazato. Unless Shin doesn’t make the cut the final two events of the year, or the same golfer wins both, she will be both leading money winner and Rookie of the Year. Also blogging about the Mizuno Classic- The Constructivist at Mostly Harmless. TC makes not of Ochoa having the lowest scoring average this year and with that the ability to win 2 of the 3 major year ending LPGA awards.